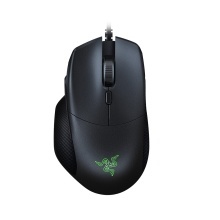 Razer DeathAdder Essential Wired Gaming Mouse with 5 independently programmable buttons is deigned for professional gamers. Equipped with the new esports-grade 6400 DPI optical sensor, the Razer DeathAdder Elite ergonomic mouse gives you the absolute advantage. Provide you with the excellent experience. Engineered to give you the unfair advantage in intense gameplay, the Razer DeathAdder Elite comes with all-new Razer Mechanical Mouse Switches. Co-designed and produced with the leading global mouse switch supplier, Omron, the new switches are optimized and tweaked for the fastest response times for gaming and for extended durability up to 50 million clicks. The Razer DeathAdder Elite features an iconic ergonomic mouse structure that top esports athletes swear by and stays incredibly comfortable even during long high-octane battles. Together with two rubber side grips, you’ll always have complete control of your gameplay. Razer&apos;s hardware based on online cloud. Set parameters such as DPI and polling rate precisely. Save files automatically and keep the same pace with cloud server.